1980's Vintage knitting pattern. 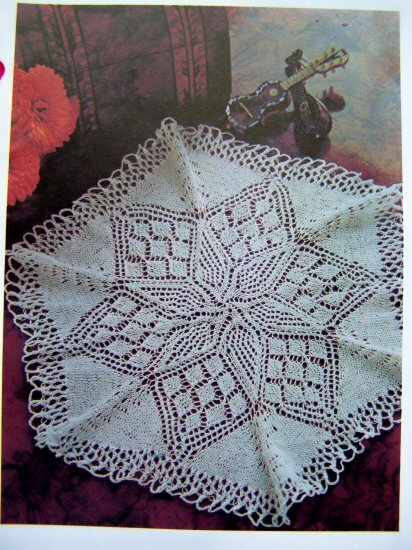 Lacy star knitted doily pattern. Original pattern not a copy. Includes only the pattern not the completed item. Book 3. This pretty doily really shows what you can do with knitting. It looks like fine lace, or delicate crochet, but its just knitting done in the round with fine needles and crochet cotton. Yarn: Bedspread weight crochet cotton. Needles: 1 set of double pointed knitting needles No 0. Circular knitting needle No 0, 16" long. Steel crochet hook size 9. This pattern was removed from a two ring binder. S & H to the USA is 1 cent folded and mailed in a long envelope. **Payments accepted: Debit cards - credit cards - online checks - balance transfers through Paypal (no Paypal account required), Money orders, Cashiers checks, Personal checks with a 10 day hold unless your a regular check paying customer.